This is not really a good before picture because you can't see the whole room. 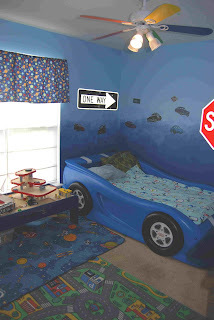 This is Matthew & Joshua's room. They share the space and J was sleeping in a race car bed and M was in a regular bed with drawers beneath it. It is a tight space with both beds next to each other. Until today! 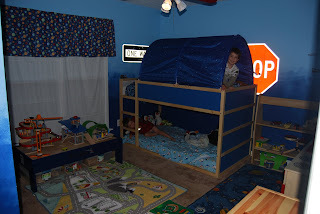 We bought the boys a low loft bed and made it into a little bunk bed. It's perfect for them because it's not any taller than Matthew and it takes up very little floor space. Floor space is a hot commodity in this house. We are going to paint the walls soon with the hopes that the house will sell soon. 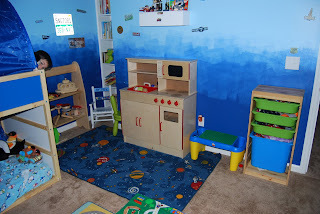 We're trying to make the rooms look larger and cleaner but it is so hard with 6 little ones! Next on my list is reorganizing my office and cleaning out the garage. I'm running out of time before Jason leaves. Only 5 more days and so much left to do.